It has been years since I have done any canning but the other day at farmer’s market I spotted some pickling cucumbers and decided to make these Crispy Sweet Bread and Butter Pickles. Growing up we had a huge garden and we spent the end of summer canning and freezing the harvest. I fondly remember my grandmother’s pickles, and today I spent my Sunday afternoon making my own and thinking of the hours spent cutting and slicing all the tomatoes, cucumbers, peppers, beans and corn with my grandmother. No matter what brand of pickles I buy in the store, nothing matches the taste of these freshly canned pickles. This recipe is so simple and with few ingredients; it makes two jars so you won’t be overwhelmed making these. I found the two jars went pretty fast so next time I am doubling the recipe. I am using a smaller cucumber, especially for pickling. The major difference between the pickling cucumber and the standard cucumber is these are smaller, they have fewer seeds, less moisture, and the skin is not as tough. I can only find the pickling cucumbers at farmer’s markets, however, you can use the regular slicing cucumbers found in grocery stores, just try to buy small ones. After you give your cucumbers a good washing slice them up in a 1/4″ slices. I love this crinkle-cut slicer to cut the cucumber, it is very easy to use and make those beautiful ridges. Put the sliced cucumbers in a nice big bowl and sprinkle the salt over them, stir and then put your bowl in the refrigerator for an hour. After 1 hour, rinse the cucumbers in a colander to remove the salt then put back into your bowl. While the cucumbers are in the refrigerator you can make the brine. The brine is made of white and brown sugar, white and apple cider vinegar, mustard seeds, celery seeds, and tumeric. Make sure the brine is still hot when you pour it over the cucumbers. Check out all the mustard seeds floating around the brine. When the brine is ready, pour it over the cucumbers and onions, give it a big stir then let sit for one hour in the refrigerator. Make sure to sterilize your glass jars and lids and when the cucumbers are ready to spoon the mixture into the jars and seal tightly. Don’t these look good? I like how the pickles retain most of the green color and they are a little bit sweet and zesty with a perfect crunch. So good! These are your classic bread and butter pickles. Flavored with mustard seed, celery seed and tumeric these pickles retain a bit of a crunch. You will love them. Wash and sterilize canning jars. Note: I have various sized jars but 2 pint-sized jars will work. Stir and bring to a simmer, cook until the sugars are dissolved. Put the pickles in the sterilized jars and refrigerate. These will stay for 3 weeks. These Crispy Sweet Bread and Butter Pickles make a nice addition to a cheese and bread plate, add some dry salami and some veggies for an appetizer or even for a light meal. My preference for eating these pickles, it would be straight out of the jar! Please do me a favor and save this pin for later. Don’t forget to grab your crinkle-cut slicer and spices so you can make these delicious pickles. I did a bit of canning last summer and really enjoyed it, I’ll have to give it another go with this recipe! You just made this pregnant lady very happy! Time for pickles for sure! Yum! I bet these do taste so much better than store-bought. I can’t wait to try them at home. I love pickled cucumbers, they are incredibly popular here in Hungary and are typically served as a side salad, I must try your recipe. Looks so delicious and so easy to make! I love pickles! We could save so much money doing pickles ourselves because we go through a lot of it. And those local, organic, healthy kind of pickles costs an arm and a leg! Such a simple thing to make ourselves so I’m not sure why I haven’t done it yet. Your post sure inspires me to make my own from now on! You are right, these take no time to make and they are good! I love homemade pickles! Once you have a taste of them, the store bought ones don’t taste good any more. Thanks for sharing ! Wow, I honestly didn’t realize it was this easy to make this. Thanks for sharing this recipe. This recipe reminds me of the bread and butter pickles my grandma used to make when I was little. Thank you for sharing it. I haven’t canned in several years, but I would love to do it again. I’ve never made these, but this recipe looks delicious!!! How cool is this?! I am a huge fan of pickles and I never really thought of making them myself. We’re moving toward more and more clean & natural foods and products so this is another great idea. Thank you! Ohmegawsh – these look so good! Those last couple of pictures have me drooling! Gotta try this! Thank you for sharing, I need to try this! My kids LOVE pickles, and I’m sure it would be healthier and probably less expensive if I made our own and canned them! What lovely memories you have of you and your grandmother sharing those special times together! Although I’ve never canned anything before, now I might have to try something new! I enjoyed reading your post – thanks so much for sharing! We love pickles but the store brands all have artificial colors, which we don’t eat, so have’t had pickles in a long time! I’m going to make a bunch of these, thanks for the recipe! Those look delicious! They remind me of my grandmother’s pickles. I need to pin this for future reference! Wow, I honestly did not know it was so easy to make these. Definitely saving this recipe. I am not a huge lover of pickles, but honestly this looks so awesome. Pinning this. Those pickles look yummy!!! They look so perfect! My aunt just canned some bread and butter and dill pickles and gave us some! I like dill better but will give the others a fair taste test! These pickles look delicious! I love a good pickle and will have to give these a try. They probably won’t last long in our house. So funny that I come to this post today. Yesterday, I was at the store and saw jarred pickles and it was so tempting, but I’m always disappointed. I’ve had homemade pickles before and there’s nothing like it. Thanks for the recipe. This is something I can easily do. So funny, this was the year we decided to can up a storm as well. I still have some more things I hope to make. But we got a lot of pickles made. You are correct, there is nothing like homemade pickles. They look so gooooood!!! Can’t wait to make them tomorrow, thank you so much for the recipe. 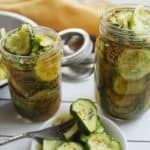 I never heard of this.I’m not really fond of pickles but I know someone who is and I bet she would love to try this recipe sending her an email right now. Awesome! I will need to try these. My husband loves bread and butter pickles..I’m more into dill pickles myself, but I like the idea of making them from scratch. Thanks for sharing! Delicious! I just realize that you use brown sugar to make pickles. I definitely will try to make it. They really are my favorite. These look so good. I’ve got a teeny kitchen, so canning is tough, but I may need to try this. Thanks! Hey there, this is a perfect recipe for a tiny kitchen, it only makes two jars. I have a real hankering for these now. Pinned the recipe! Thank you for sharing! Cool to see you made pickles. I am getting ready to do the same thing next weekend with the cucumbers I got in my CSA box. Pickles are great. Enjoy them. This batch went by so fast I need to make some more. I made these and loved them. This recipe makes a perfect amount and they came out perfect. I really love this recipe! I will be making it, it seems just so easy! I can’t wait to go buy the items and try this out. Thanks! I use to love pickles when I was a kid but as an adult they aren’t a favorite. As a kid I wouldn’t eat them even though I canned them. Now I find myself craving them. I love bread and butter pickles. One of my favorite things to snack on. These actually look very easy to make and I have been wanting to try making my own. Thanks for the recipe! Those look fantastic…well worth the work! Those pickles do look really good! Do they have that name because they traditionally accompany bread and butter? Good question – there seems to be several different theories mostly that they originated during the depression when people would cucumbers with bread and butter. The cucumber were cheap and easy to grown. If you dig deeper they originated in Europe. I thought they originated in my Grandma’s kitchen. Yum! I like making small batches of pickles and the like as well. I don’t want to have to spend all day doing it, but as you said, they’re so much better than store bought! This year I made pickled beets for the first time, and they’re amazing. Now the hard part is rationing them. I use to make pickled beets too. We always put hard-boiled eggs in the beet juice. I’m not sure I’ve ever considered making my own pickles. Since I love them, it may be something I should try. April, you should give these pickles a try. They are easy and actually very fun to make. You had me at pickle. We love pickles in my house. We also love to cook. Last year I bought a whole case of mason jars just sure I was going to make jam. Yes, they sit there in the unopened package today. Today however, I have been inspired by you fabulous photos. I plan to put those jars to good use. These look delicious. The recipe doesn’t look too complicated. I need to give these a try. I’ve been to some farmers markets in San Diego, they really have a bounty of great fruits and veggies there. I’m from NorCal and feel blessed with the great farmers markets to go to here. This brings back memories of pickling as a child. I grew up on a farm and we had huge batches to pickle. Homemade pickles are still the best! Don’t you love those fond memories? These look delicious! I LOOOVVVEEE sour pickles, but I’ve never liked sweet pickles. Yours look so tasty though, I’d be willing to give them a second chance! You may convert me yet! Hey, give these a try, they are probably a 6 on the scale of sweetness. I’ve always wanted to make pickles! What a great recipe. Do you know if you can use a sugar substitute? I don’t eat sugar. Thank you! I don’t know about not using sugar in when making pickles. The sugar is needed to reduce the acidity of the vinegar. I did read that you can replace sugar with honey but you need to reduce the amount by a 1/4 cup since honey is much sweeter than sugar. Oh my goodness, I don’t know if I’ve ever wanted to eat a bunch of pickles so much as I do right now! I LOVE pickles!! This looks like a fantastic recipe. Do you know if there is much leeway in how much salt needs to be used? I have a health condition right now that requires me to be on a low sodium diet so I’d love to find a way to make lower sodium pickles! Less sodium per pickle means more pickles I get to eat! 🙂 I will definitely add the recipe to my collection, though. Thank you! I think you would be safe to use less salt, the salt makes the pickles softer. You do rinse the cucumbers to get rid of the salt so I think most of the salt would be gone.